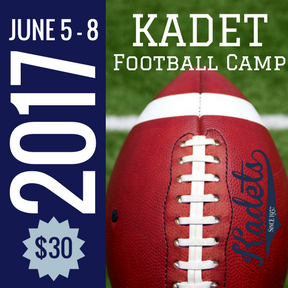 Kadet Football Camp features grade level appropriate competitive drills and games with a focus on skill development, fundamentals, and lots of fun! I hereby grant permission for my child to participate in the Air Academy Sport Camp. It is understood that supervision is provided, but my child may be exposed to risk of injury encountered by participants in this type of activity without liability to Academy School District #20, Coach Forman, and the camp staff. Please accept my signature as proof that my child is in good physical health and can participate fully in this camp. In event of an emergency requiring medical attention, you have my permission to secure proper medical care and are released from any liability. How would you like to pay $30 registration fee? After completing this form, please click Submit Form. You will receive a confirmation email. If you do not receive the email within a few minutes, please check your spam; otherwise, please contact us at djforman4@gmail.com.